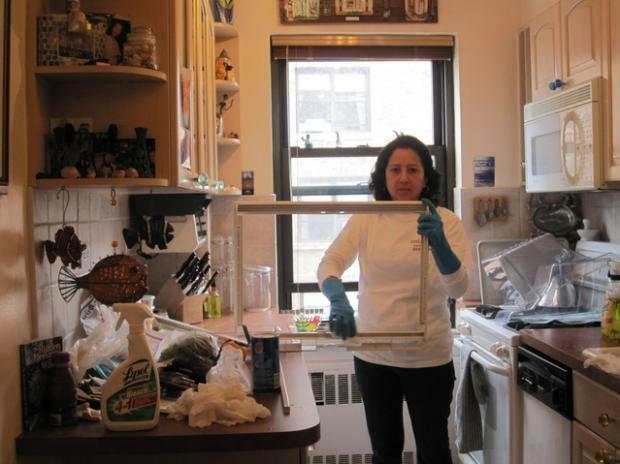 UPPER WEST SIDE — They tackle bedbug infestations, hoarder's homes and post-construction messes, but Home Clean Home also specializes in a niche market — Passover cleaning. To ready one's home for the Jewish holiday that starts Monday night, families must remove all traces of chametz — leavened bread — from refrigerator shelves, bed board crevices and everywhere in between. But why shake out your own clothes pockets, if you can hire someone to do so for $500 and up? Upper West Sider Jeff Levine was amazed when he saw the workers steam-cleaning his Tempur-Pedic mattress in preparation for the holiday. The trial lawyer had always done his own Passover cleaning, but this year he was so busy he brought in the professionals. Cleaners from the Brooklyn-based company, which has clients across Manhattan, go over every surface. They vacuum sofas, mattresses and box springs, wash the carpets, empty the cabinets. They clean the oven and refrigerator, checking for traces of chametz with a white glove and Q-tip. "It's a very detailed job," said Hananya Ederi, Home Clean Home's project manager. "For bedbugs and Passover, it's almost the same — very detailed." "It's back-breaking," Levine said watching three cleaners scour his apartment as he was "still trying to get my head around" farming out the job. "When I do it, it's not just a physical cleansing. It's a spiritual cleansing. When I get rid of the chametz, I'm thinking about what I'm cleaning out of myself." The cleaning team provided instructions before they came, asking him to remove do the first round of removing leavened bread and providing them with paper towels. They don't want to use the same rags from one house to another in case chametz gets on them, Ederi explained. They also gave Levine the option of having them put chametz away in a locked box. (He chose to get rid of all of it.) Ederi explained that some Jews will, through their rabbi, "sell" their chametz to a non-Jew for a specific price, but still be able to keep the chametz locked up at home and then buy it back after the holiday. Levine still planned to do some other parts of the ritualistic cleaning. On Sunday night he planned to hide 10 pieces of chametz and then sweep them up by candlelight with a feather and wooden spoon into a paper bag. On Monday, the morning before the seder meal, he planned to burn it on his building's roof — in a "controlled environment," he noted. "It's literally a burnt offering," Levine said. He explained that the leavened bread, with its air and space, is compared to the puffing of the ego, while the matzoh – or unleavened bread — eaten during the holiday represented humility. The search for the chametz, Levine said, was a symbolic purge of the ego. "There's an inner spirituality," he said. "Otherwise it's just spring cleaning."